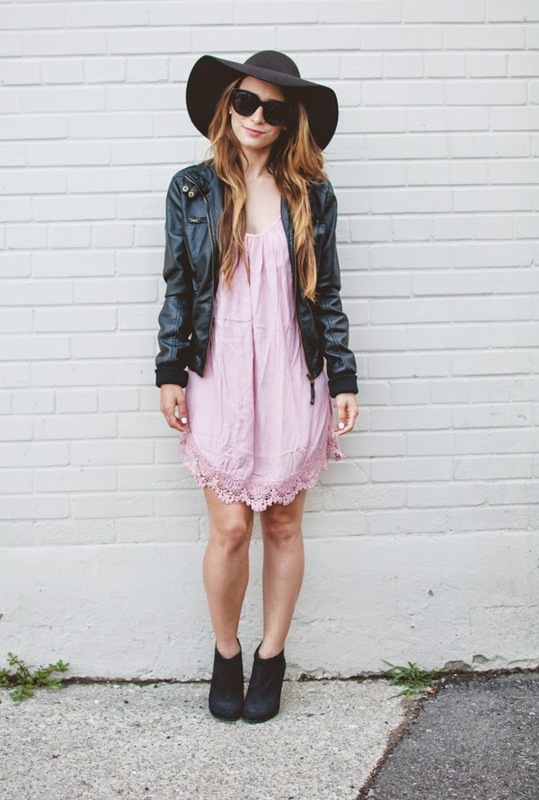 OOTD - Blush Slip Dress for Nightime | La Petite Noob | A Toronto-Based Fashion and Lifestyle Blog. Oh the life of a non-rich Noob fashion blogger, wearing a blush slip dress last seen here and a vegan leather jacket last seen here. Two recycled pieces - the horror! Well in my quest for chipping away at my 30 things to do before 30 list and developing a personal style, I have quickly discovered the importance of developing an interchangeable wardrobe. Having pieces of clothing that are easily remixed to accommodate different looks and seasons not only simplifies my wardrobe, but also keeps my credit card from bursting into flames. This blush slip dress easily transitions for chilly summer nights with the addition of a lightweight vegan leather jacket, booties and a floppy hat. Simple - just as I like it. Read on for additional photos and outfit details. On a complete side note: at the same time that I've realized my complete love for hats, I've also come to understand that I have a ridiculously small head. Seriously this Noob has got herself pea sized head and has had the worst time finding a hat that fits. Does anyone have any tricks as to make a hat smaller? Let a small-noggin Noob know! Thank you Kris, I definitely feel recharged! The color of your slip suits you so well! I admire fashion bloggers who re-use pieces in their wardrobe - it's so much more realistic and creative! If you're interested I just put up a post of my ootd and meeting Pixiwoo! -check it out!